Man is influenced by many external forces; these could be reading books, songs or discourses while pursuing the spiritual path. In the path of Sai-ism, one often finds that BABA provides us with opportunities to learn new things. I have come across this particular song, which has moved me a lot. There are plenty of songs on Shirdi Sai BABA, but why did this song move me – only BABA can give an answer for it. Those who have not heard this song, it is a folk song describing the leelas of Shirdi Sai BABA. When it comes to these lines every time that I listen I become teary and act in a most silly manner that one would not perceive of a sane person. It is not once, but every time I listen I cry. There has to be a reason for this insanity. I guess insanity can be only associated with Shirdi Sai BABA, as he himself was considered a crazy ‘old man’. So I take comfort in knowing that I try to be an insane follower of Shirdi Sai BABA’s teachings and it is understood that it is surely a very hard task. Numerous works have been done in spreading Sai philosophy worldwide by ardent followers of Sai BABA who have read and assimilated Sai and His principles. They do it with so much vigor and passion, which is evident from the selfless works and efforts they have put into it. The main reason behind such works done by Sai followers is to bring about change and influence the thoughts of man in this Kaliyuga and to show the path of humanitarianism, there by accomplishing the spiritual needs that are laid down by the Shastras and Vedas. This particular piece of work by Guruji has touched my heart very deeply. While listening to this particular song, a thought was put into my head. Lord Sainath himself purely triggers these thoughts and any imperfections are mine. So please bear with me. – Why did Baba have to go begging for food when people flocked him and served tasty dishes wherever he was? – BABA was an Anantha, the supreme lord of the universe, who had the whole universe in him. He was beyond the senses of Hunger and thirst, so there has to be a reason for begging. – What is the writer trying to say when he wrote these lines about BABA and his children? Satcharita explains purely about love and compassion through various incidents and anecdotes that were documented by Hemadpant. The reason for BABA resorting to begging bowl is also very beautifully elaborated in Chapter 8 and Chapter 9 of Satcharita. I personally feel that BABA’s begging denote the selfless act of compassion and love that a mother has for her children. BABA begged to satiate the hunger of dogs and the servant who cleaned the floor. How could a mother see the hunger of his children? He took upon himself to beg on behalf of his children whom he loved most. His love for us (devotees) is unfathomable. It has no scales or boundaries to measure. Though Vasudev Himself, He has gone to streets begging not just food, but also begging for happiness and welfare for His children from Lord Narayana dwelling in the hearts of people. This begging denotes calling for love, it is not food that BABA was looking for, and it is love He sought from his devotees. BABA lived on love and preached love. BABA himself being Narayana how could He distinguish and rate love that He got from different houses? For Him who loved the Universe, Love had one face and color. Hence, He collected and mixed food together and tasted the love of His devotees. BABA shared that love with all living creatures, how fortunate was the lady who took bread from the kolamba. How fortunate were the dogs and cats, which partook the same food. 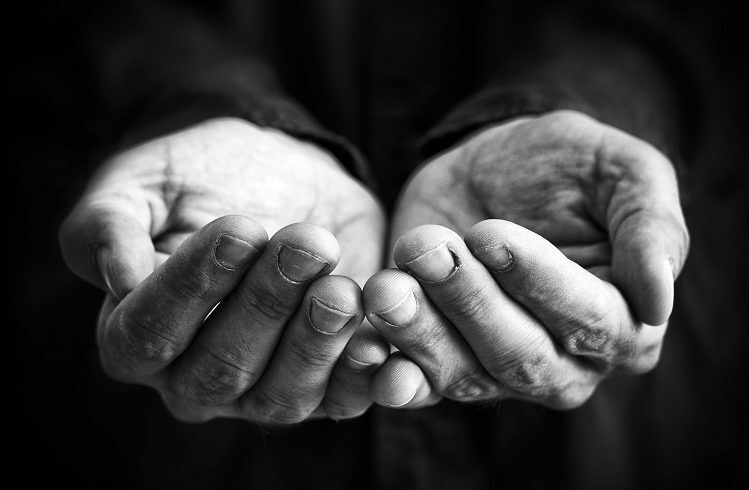 While giving alms, it is laid out in Shastras that one must give with humility, love, compassion, and liberality and with reverence, knowing fully well that serving a hungry man is equivalent to serving God. Giving away something belonging to us also denotes developing detachment and removing the tag of “I” or “mine” attached to the things. BABA himself has clearly demonstrated this philosophy when He tested the seeker of Brahma jnana when BABA asked him for Rs 5 (chapter 16/17). BABA explicitly said that “For seeing Brahman one has to give five things, i.e. surrender five things viz. (1) Five Pranas (vital forces), (2) Five senses (five of action and five of perception), (3) mind, (4) intellect and (5) ego.” Each of the houses that BABA begged denotes the five senses, which when surrendered to the feet of Hari, the man then attains salvation. Look at the compassion this frail old man had for His children. HE took upon Himself the ailments suffered by them, as he took on the bubo’s of plague suffered by Mrs. Kaparde’s son at a distant place. BABA is like a wick in the lamp, which burns slowly to give light to others. He is not worried about His hardships, all He thought was happiness of His children only. This selfless act and love of BABA brings tears to eyes. One who understands this unconditional love of BABA surely questions as to what have we done to deserve this love? What does HE expect in return? – SHRADDA and SABURI.